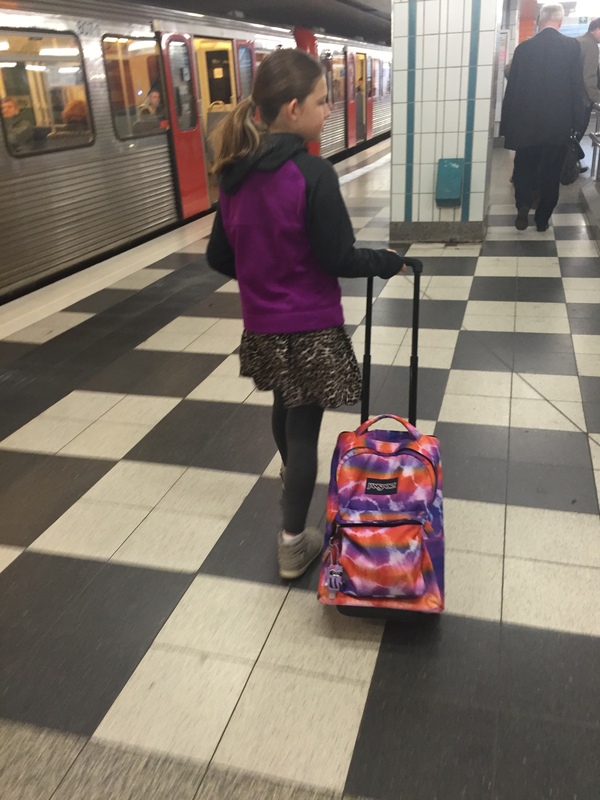 Since we moved to Hamburg, Astrid has been going to school during the week. All it took was an email exchange and a brief phone call to the local Waldorf School. No forms, no document check. Guess the German bureaucracy has relaxed quite a bit over the years. The daughter unit loves to arrive at the school at 7.30am to play with her friends, requiring us to leave the house shortly before 7. Two days a week we ride as a team on the subway/bus to the school, 3 days a week she rides by herself the last portion on the bus. 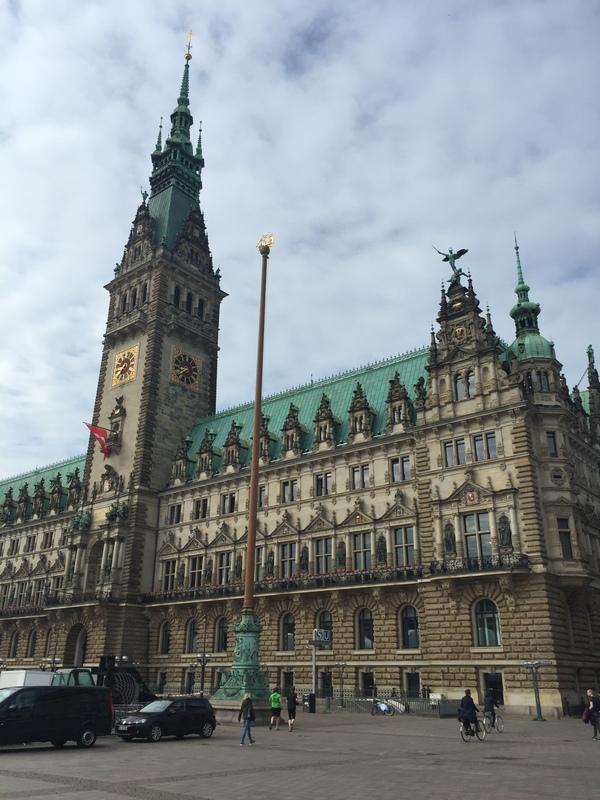 Her school is in Altona, a former Danish harbor town that became part of Hamburg in 1937. On those 2 days when I ride with her to Altona, I take the opportunity to run/walk the 8 miles from the school to our apartment. Walking down a few steps through a beautiful park, and the harbor welcomes you. 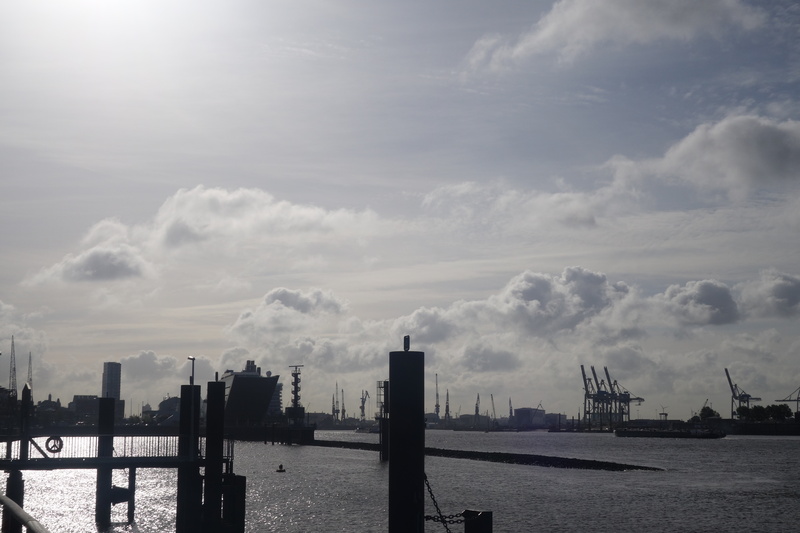 The third largest port in Europe, the harbor influenced Hamburg culturally and sociologically throughout the centuries. The red light district is not far away, even though it’s almost impossible to spot any sailors in the hipster bars anymore. 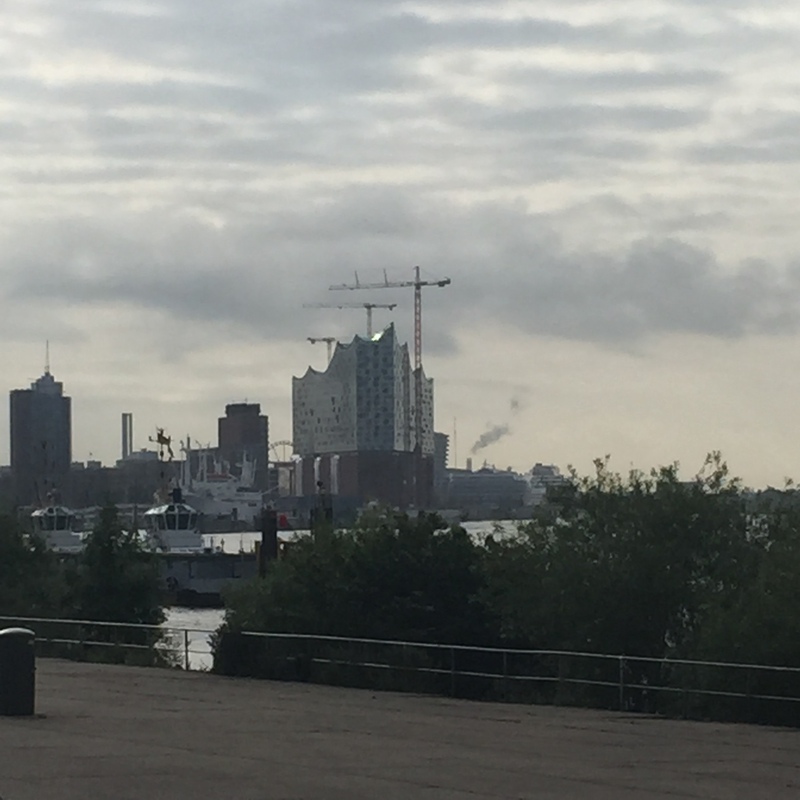 Hamburg is a booming city, you see new buildings and construction everywhere. 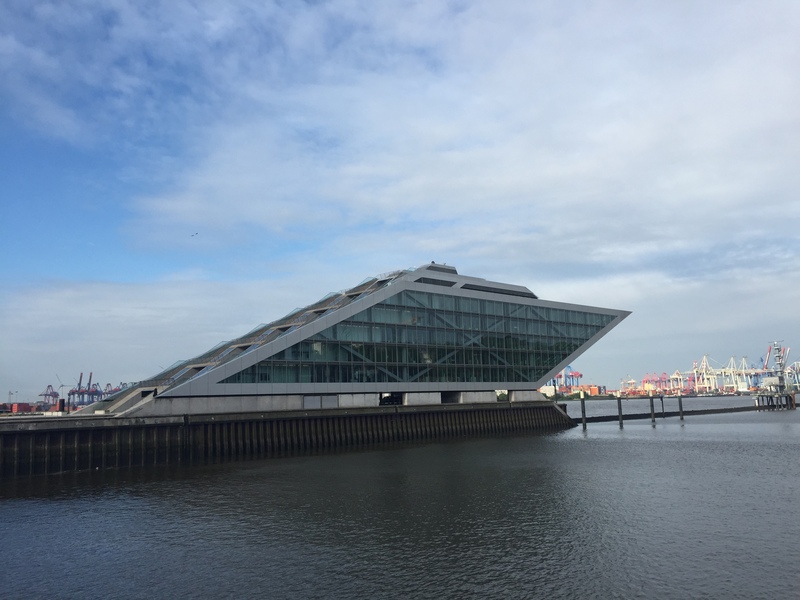 This building is called “Dockland”, only a few years old. Rumor has it, advertising agencies and new media companies are filling the space. You can walk up the steps and enjoy the view from the roof terrace. In the distance the Elbphilharmonie (Elbe Philharmonic Hall). It was originally scheduled to open in 2010, the current date is 2017. Oh, and the investment has tripled in just 10 years. Besides the concert hall, it will contain a hotel and apartments. Further down, a view of Speicherstadt, the largest warehouse district in the world. I used to walk around that area to smell all the different spices and produce from all around the world. 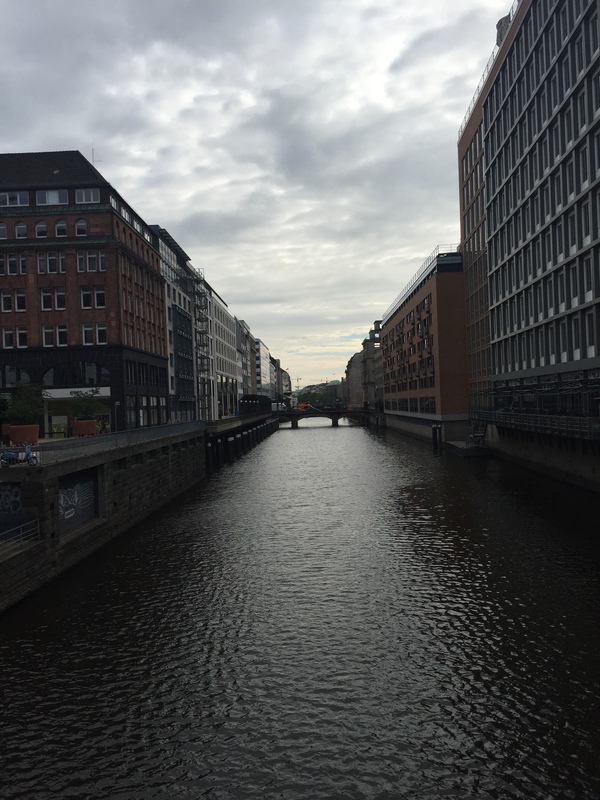 Today, Speicherstadt is one of the biggest redevelopment projects in Germany. New Media companies, designers, architects and other service companies are transforming this part of town. 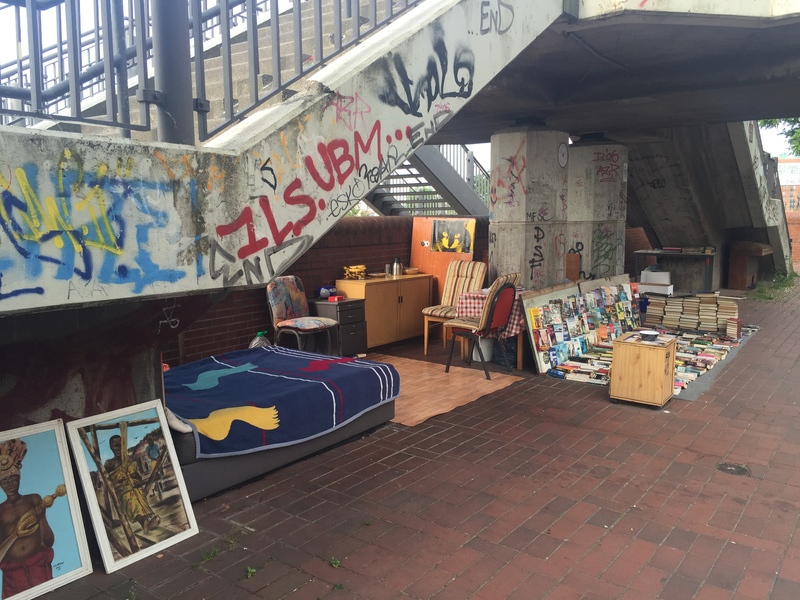 Homelessness is not common in Germany. Walking by this ‘apartment’ I wondered if this is just “Wallessness” and not homelessness. The owner sleeps in a hidden corner, one bed is always made for guests, there’s a piano, a dining room and numerous books/artifacts for sale. 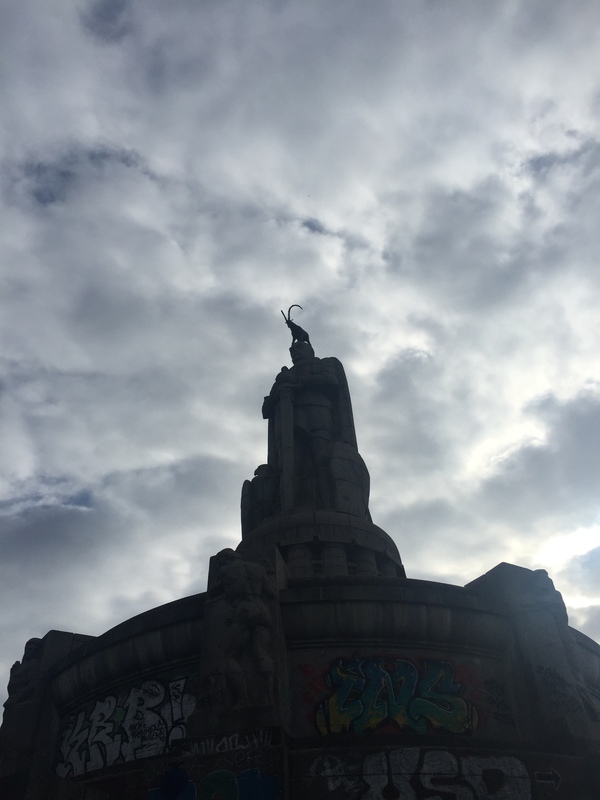 You turn left towards the city and old Bismarck is towering over the red light district. Underneath the statue is a bunker that saved more than 600 people during the air raids in WWII. Oh, and yes, there’s a capricorn on top of his head. It’s a temporary art project with the goal to undermine the cult of Bismarck. 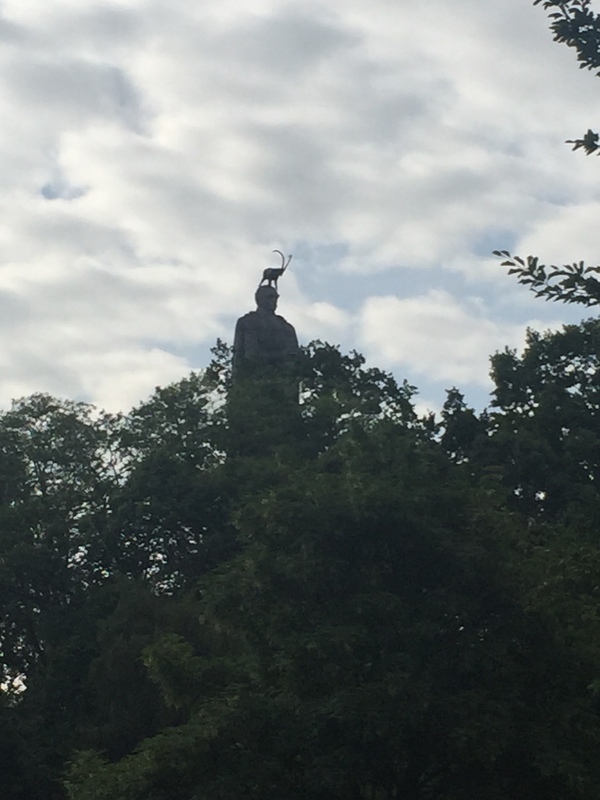 Seeing the capricorn on the head of Bismarck definitely surprised me. Loved the playfulness of dealing with history. 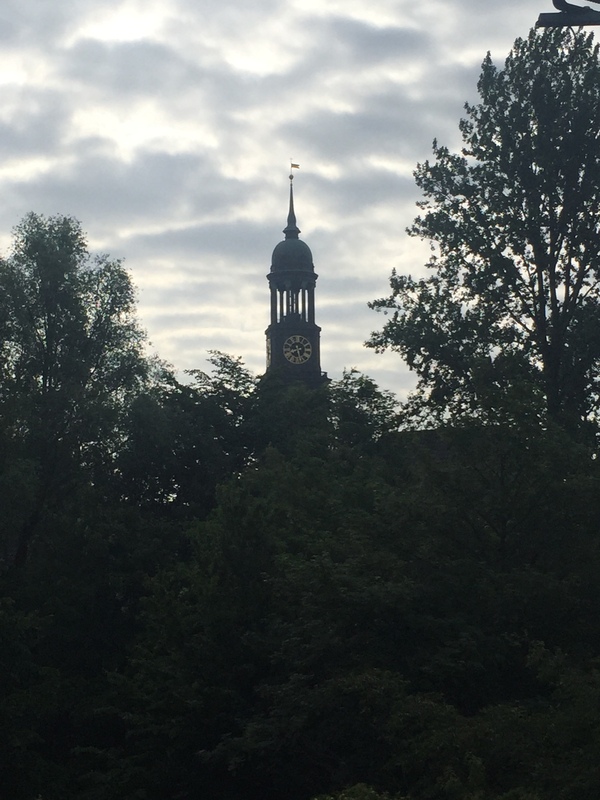 From the Bismarck statue, you can catch a view of the “Michel” (St. Michael’s church), the largest church in Hamburg. We’ll catch a service one of these Sundays. Heading towards the center, you walk over canals and bridges. Need a good trivia question? 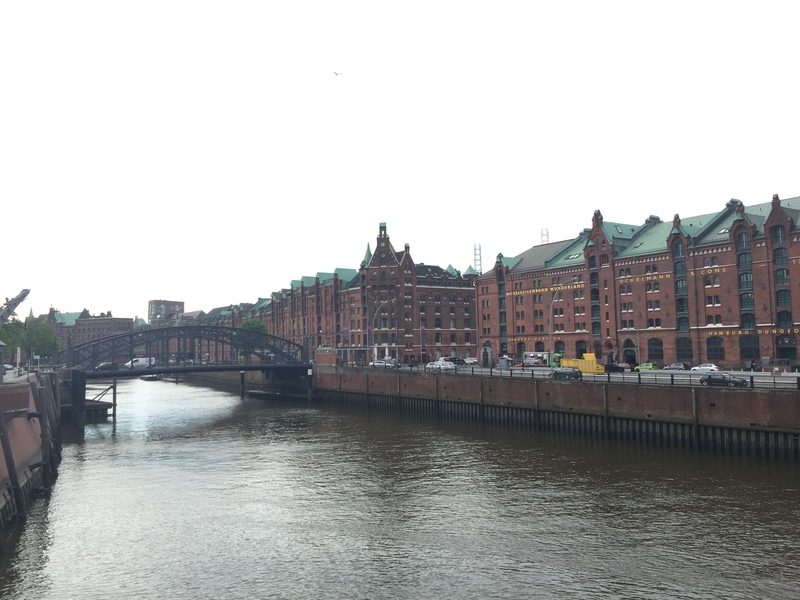 Hamburg has more bridges than Venice, Amsterdam and London combined. 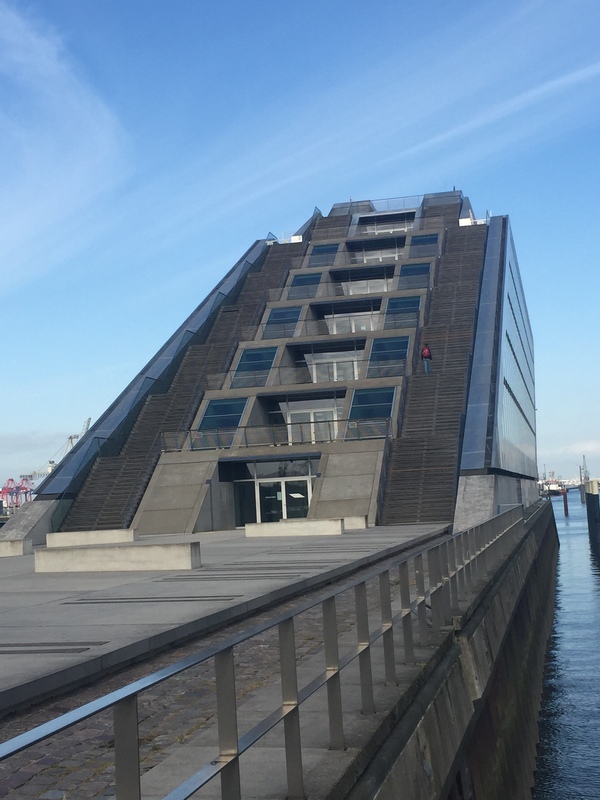 Yup, Hamburg has the most bridges in the world. The center of the city is dominated by City Hall, resting on 4,000 wooden poles. 120 years of storms and rainy weather have not diminished the beauty of this magnificent building. Around the lake are bike and running paths, dog parks, fields for people to enjoy the sun and beer, statues and a lot of wildlife. 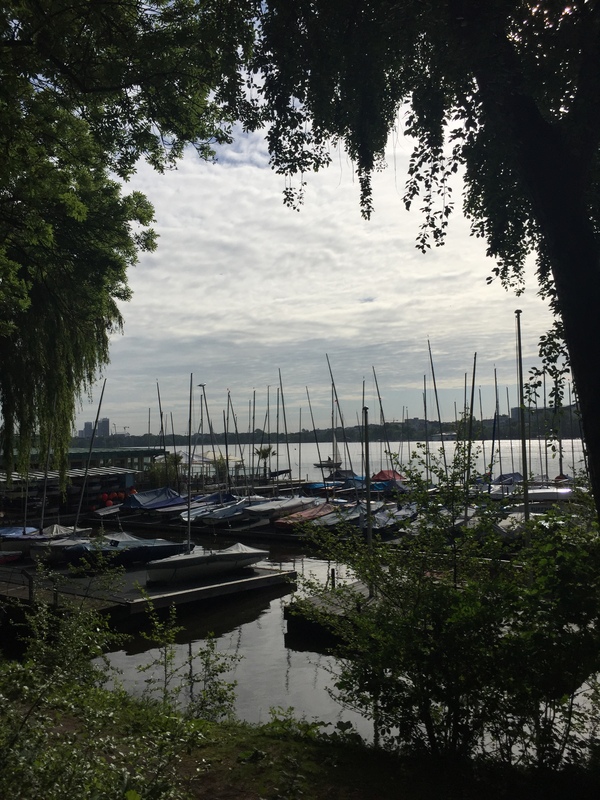 The Alster is my happy place. 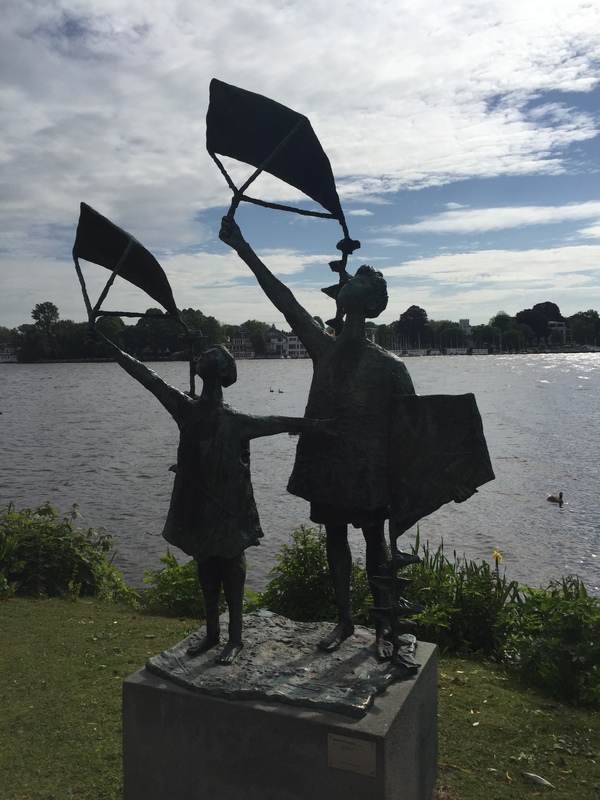 No matter the weather, the Alster always makes me smile. A few more steps, a quick stop at the bakery for fresh rolls and the day can begin. 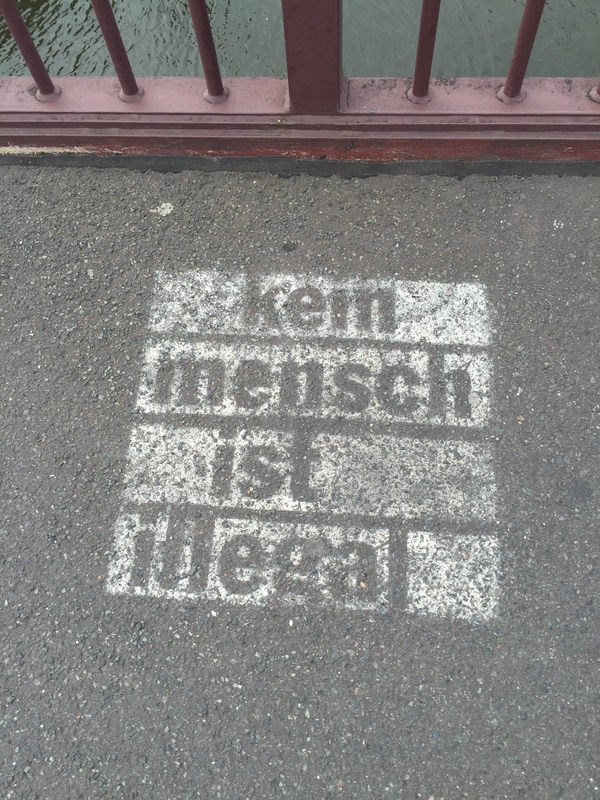 Just being in Hamburg makes me smile. Enjoying the magic of Hamburg makes me really happy.